Marro. 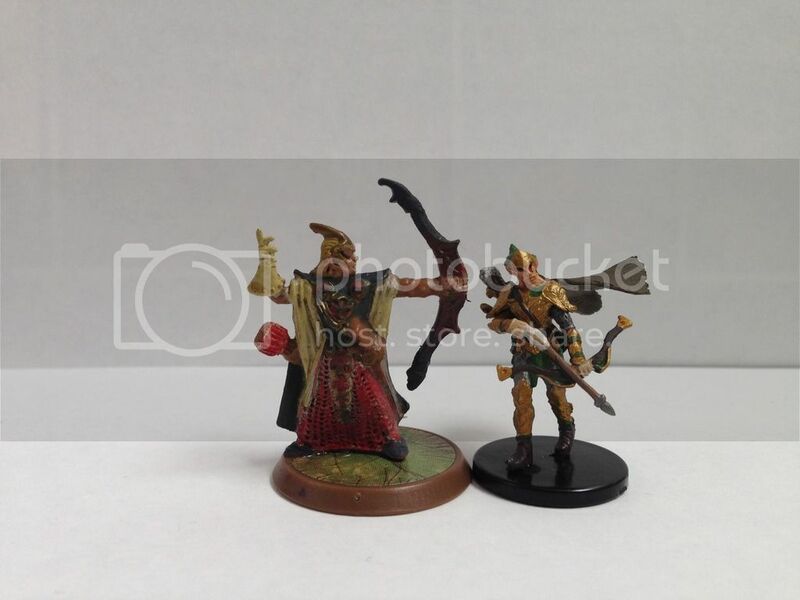 One of the most unique and distinctive creations of the Heroscape line. Of course we want more of them, though being distinctive makes it more difficult to find suitable miniatures. At 150 points Kon-Tar-Na has to pull a fair amount of weight. In terms of stats he's quite solid: a strong 5 Attack with potential for multiple attacks, a very solid 5/4 Life/Defense combo, and 6 Move plus a movement power. A couple of different bonding options also gives him more ways to shine. While there are other comparisons in the 150 point range, I think the most valuable comparison is Wo-Sa-Ga. While the two melee Hivelords have similar stats, KTN's extra life, mobility, and double-attack potential edge out WSG's benefits, justifying KTN's higher cost. A leaping, blood-hungry marro hivelord? Works for me. At one time I would have said that Hivelords needed to be leaders, but neither Tor-Kul-Na nor Wo-Sa-Ga fit that mold particularly well. Relentless matches KTN's playstyle well. I might have preferred Wild, but that has synergy implications. The big question is the sculpt. Is it marro enough? Honestly, I was really on the fence on this one. The pictures of the figure looked pretty good, but when I got it in hand and set it next to the other marro I was ready to reject it. The bluish tint (at least on my copy) and pinkish coloring doesn't really mesh, even with the existing variation in the marro line. When I took a closer look, though, my feelings changed. The face, the weird texture of the torso, and the armor reminiscent of Ne-Gok-Sa's really makes him look like a marro up close. I got some input from the rest of the Inner Sanctum, who were generally accepting of the sculpt as a marro. In the end, the details of the figure persuaded me. After all, if people don't like the coloring they can repaint it. It's not the first time I've seen a leaping attack implemented, though this one is done well. Taste of Blood is a neat way to give him a version of a second attack that is both more potent than usual (comes with a movement) and more limited (he has to get a kill to use it). Kon-Tar-Na seems straightforward to play: charge or leap into battle, kill something, leap, kill something else. It really isn't that simple though. Once he is engaged with multiple figures it gets painful to use Taste of Blood to leap and attack since he'll take leaving engagement attacks. Playing against him it's best to tie him down quickly to reduce (often nearly eliminate) his multi-attack potential. Leaping to the next target also tends to separate him from his bonding pals, leaving him to fight on his own. With 5 Life and 4 Defense he can hold out for a bit, but he's far from unbreakable. It is particularly bad to separate him from Nagrubs, as munching on them can really help his survivability. But the Hivelord can be a serious threat, to some extent regardless of how he's played. Whether skirting around the edges of the battle, maximizing Taste of Blood and staying close to his allies, or recklessly leaping forward to take down a prime target, KTN can do some real damage. He's more potent against squads (even high defense ones) as they can provide him with multiple attacks more readily. I enjoyed playing Kon-Tar-Na. Maximizing his potential is more complex that it first appears, and he's a big enough threat to need to hunt down aggressively when you're playing against him. For me, it came down to the figure. A borderline case, but in the end I feel he's marro enough. Did the name of this figure get posted somewhere? I think this needs a more clearly defined limit of how many markers he can receive. He can only get them through the power, and if he has 3 or more he can't use the power, so it stands to reason that the maximum is 3. I actually hope somebody didn't claim that officially. It sounds pretty ridiculous. For what its worth, I believe the quote comes from Su Bak Na's bio on the heroscape wiki, which includes the sentence "Mounted on his pseudo-dragon Wulsinu, Su-Bak-Na can survey his surroundings in an instant and fly to wherever his daunting presence is required." Interestingly enough, this differs from the bio found in the book of Su-Bak-Na here on heroscapers, which says "Mounted on his skeletal dragon, Su-Bak-Na can survey his surroundings in an instant and fly to wherever his daunting presence is required." I'm not sure which is the original text from the hasbro website, but I'd be inclined to trust heroscapers over the wiki. Yeah, the wiki makes up its own bios, or edits them as he pleases, as you've seen there. I've talked to the guy before, and let's just say he's at odds with some things 'Scape, notably DnD and its official inclusion into the HeroScape universe. If "Junior" is within 3 clear sight spaces of a friendly figure, subtract 5 from his range. "Junior" grew up without knowing his father. His mother told him that his father was arrogant, but could back up his talk. All he ever wanted to do in his life was live up to his dad's reputation. He began training at a young age to try to complete the four tests of the Queen. After completing the first three, "Junior" ended up short. He went back to training, he swore to anyone that he could hit a target farther away than any elf has ever hit. The crowds gathered to watch this drop out try the impossible task. "Junior" drew back his bow. "Thooft!" His arrow sailed only half way. Everyone laughed at the disgrace he had brought upon himself. Only he knows his true potential... And so does Ullar. So in other words, have you have done something so amazing and no one was there to see it? Then you yell, "hey dad check out what I can do!" then fail miserably. When you compare "Junior" to other figures similar to him you will find that 15 is actually a great point value. 1. Guilty: The offensive output between "Junior" and Guilty is about half. Guilty gets two attacks of 2 at 7 range, whereas "Junior" gets one at 10 or even 5 range. Their survivability is the same however. 2. Dead Eye Dan: Only two figures with 10 range, but also share defense and move values. The reason I'm comfortable with "Junior" at 15 compared to DED's 60 is that DED has the ability to completely destroy any figure. That has to be at least worth 30 of his points. Add in the ability to bypass defensive abilities, let's say add another 10-15. Increase his health and there you get about 60. 3. Marcu: This one is tough. Costing lower than Marcu is dangerous, because Marcu really has the ability to hurt you, whereas "Junior" won't kill your own troops. Even with Marcu turning on you, he will beat "Junior" most of the time. I believe "Junior" is a super simpler figure. His power is very obvious also. Haven't you always wanted to take DED just to run and gun with? I have. This guy will find the table almost too often because he is so fun to use. His lacks a lot of synergy, but that also will keep his point value down and maybe even keep him off the table every game. I sometimes have trouble coming up with new powers. I tend to stick to reusing most powers. This guy is different. He captures so much theme with one power. The simplicity is what makes this guy creative. With that one power it's like you almost know everything there is to know about this guy. The guy who always fails in the eyes of others, even though he knows he has the ability in him. Here's another picture for size comparison. Here's him next to his "father". He's still a young man trying to make his way in Feylund. Accessibility The figure is a Pathfinder mini so there has to be plenty of them. I haven't looked to deep into this. (Sorry in advance) I think I paid around 5 bucks for him which isn't steep at all. Thanks for your time. I hope you can feel the theme of Junior. He's found a place in my heart already. I would like to submit The Gnoll Faction to SOV. The Retchtongue Warclan comes from the world of Toril(D&D). They were designed with the concept depicted in the D&D source books. Gnolls like to attack when they have the advantage of numbers, using horde tactics and their physical strength to overwhelm and knock down their opponents. They show little discipline when fighting unless they have a strong leader; at such times, they can maintain ranks and fight as a unit. While they do not usually prepare traps, they do use ambushes and try to attack from a flanking position. The Power that the War chieftain brings to the clan helps organize them and allows them to fight better as a unit. 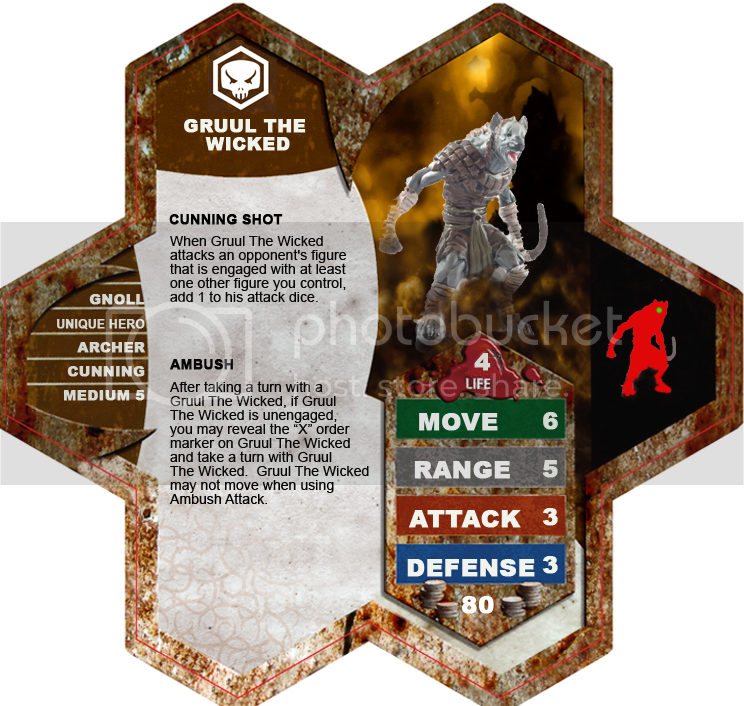 Ambush Tactics utlized by Gruul the Archer, his cunning nature gives him a leg up on the enemy. 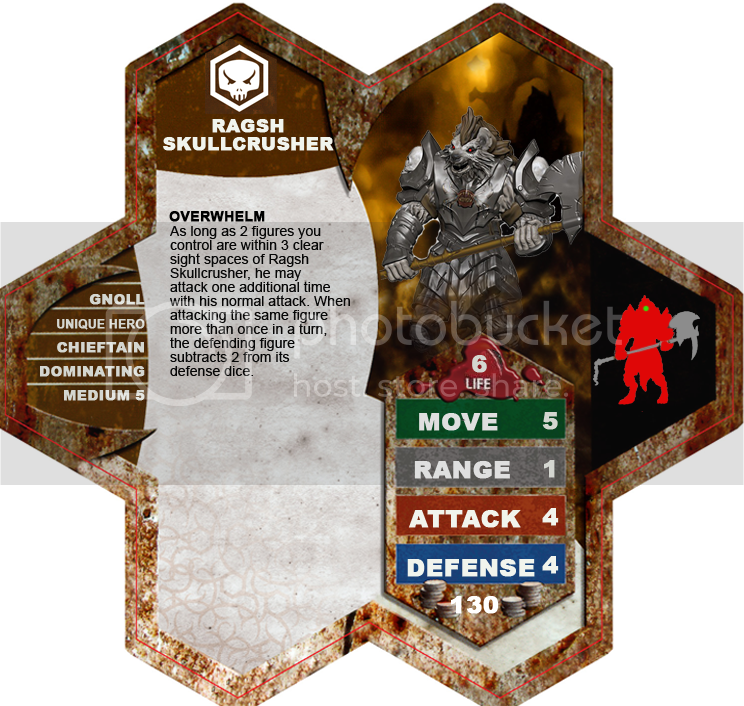 Ragsh Skullcrusher, has been able to round up the Clan and organize them. They howl with glee when they have numbers advantages and their relentless nature comes out. Ragsh wades into battle confidently when he knows the warband is close, confident and secure in victory he will unleash a torrent of attacks. The Squad comes in at 20 points per figure, more than some of the strongest 4 man bonding squads such as 17.5 for Heavies/Knights/Dwarves. The Heroes are priced accordingly with their powers and how they interact with the warclan. They offer a great variety with the clan. Alternate Gnolls - There are some good Alternate Sculpts such as Gnoll Claw Fighter 77+, Gnoll Fighter 43+ to consider if any questions of availability. 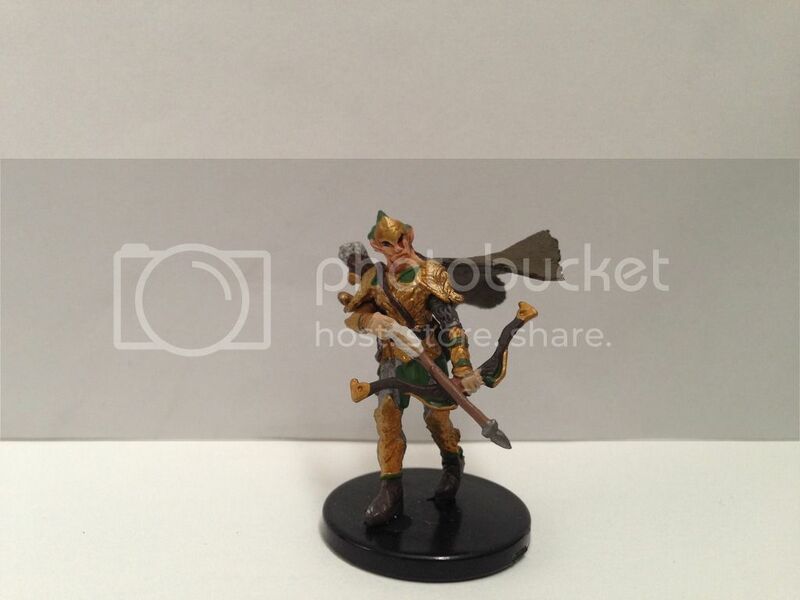 Gruul - Gnoll fighter(U) #22 Elemental Evil D&D - 84+ found from 12 retailors at 3.50-6.00 a figure. Special Credit to - Scytale (Pack Attack was his design. ), Kevindola/Bengi/Dok and others who commented, helped playtest, and had suggestions along the way. Last edited by Kinseth; June 22nd, 2015 at 01:48 PM. $6.50-$12 a squad is a little expensive, but it is within the range of reasonable market prices for some existing classic squads so I won't let that hold up my vote. It may be an issue for other judges or the Inner Sanctum. to review the Gnoll faction. I'm a faction guy, so I'm excited to see someone use our (relatively) new faction submission system. This group is a good example of units that were refined by soliciting feedback. Overall they seem lean and solid.